I know, saying “Nutella” and “healthy” in the same sentence sounds as if it could only be one from Ferrero, Nutellas father, himself. But with this recipe it does really become true. 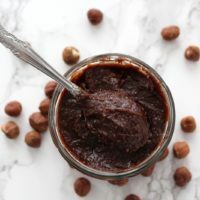 With only three ingredients you can make a healthy version of this addictive chocolate spread and even eat it straight out of the jar without regret. Seriously. Hi, my name is Mina and I’m a Nutellaholic. Yes I’m one of those people who never liked the chocolate spread on their bread but instead I used to eat it straight out of the jar. I think some of you can relate to that…the problem is that it’s loaded with calories and very unhealthy, too. Now this recipe may not be very light either. However, it’s not loaded with empty calories but actually contains nourishing ingredients instead. The original Nutella consists mainly of sugar and palm oil. Furthermore it contains milk powder, soya lecithin and vanillin. By the way, ingredients are always listed in order of quantity. 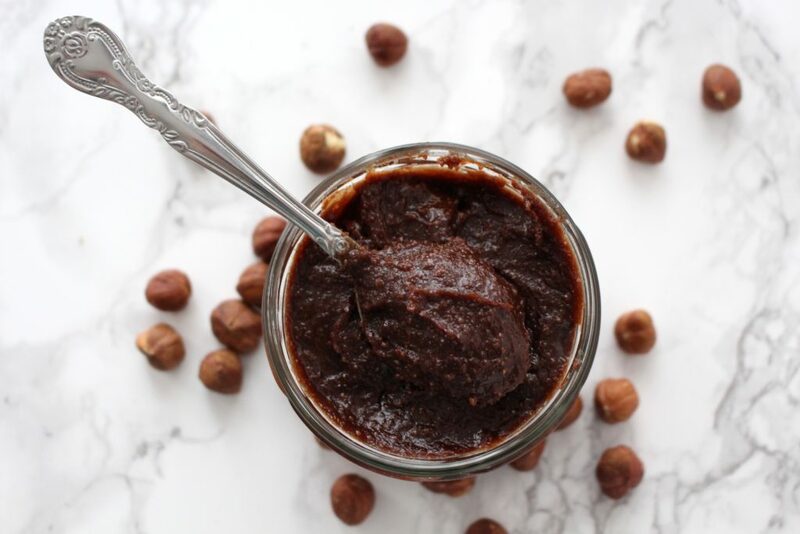 So even though it’s supposed to be a chocolate nut spread, hazelnuts and cocoa only play secondary roles here. Aside from health reasons, products containing palm oil should be avoided for environmental reasons also. 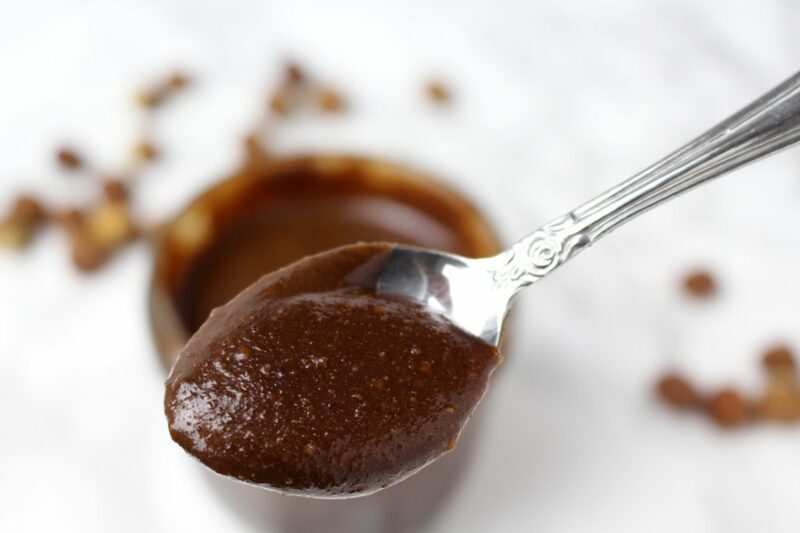 While this may seem impossible because there’s palm oil in cosmetics, cleaning agents and seemingly everywhere, making your own chocolate spread may be a good start. I actually became aware of the consequences of palm deforestation when the acrid smog coming from Indonesia blanketed Singapore so much, we weren’t able to see the building towards us at a roof top bar on the 65th floor. Anyway, this recipe calls for hazelnuts, maple syrup, cacao, vanilla and salt – the last two of which are optional. I would, however, recommend using them, since chocolate tastes even more chocolatey with vanilla added and salt makes it even sweeter. I also add a few tablespoons of rice milk to give it that smooth consistency, but this isn’t absolutely necessary either. However, this chocolate hazelnut spread really lives up to its name. So don’t hesitate and invest some money – yes, uncut always is more expensive – and 20 minutes of your time to really enjoy this delicious spread without guilt. Straight out of the jar if you’re like me…mmmhhh! 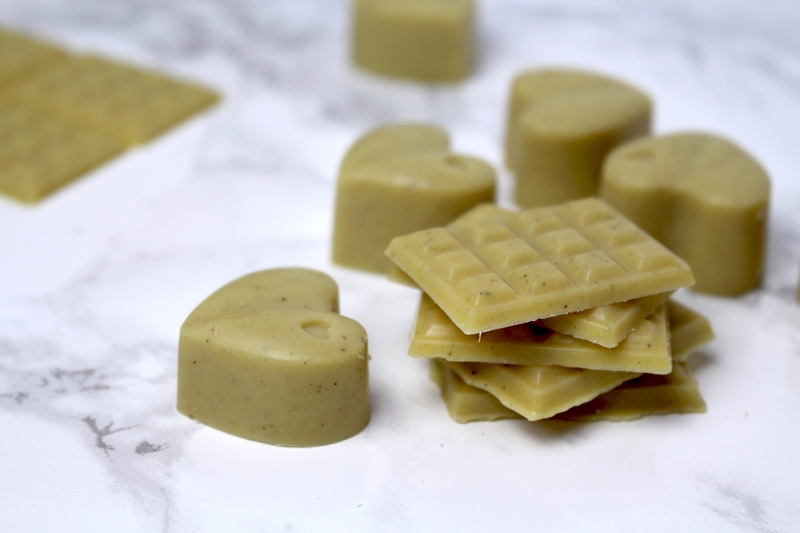 Also, if you don’t have a food processor, you could buy hazelnut butter instead (make sure hazelnuts are the only ingredient) and mix in all the other ingredients. And there you have it: healthy Nutella in two minutes. It doesn’t get any better than that! 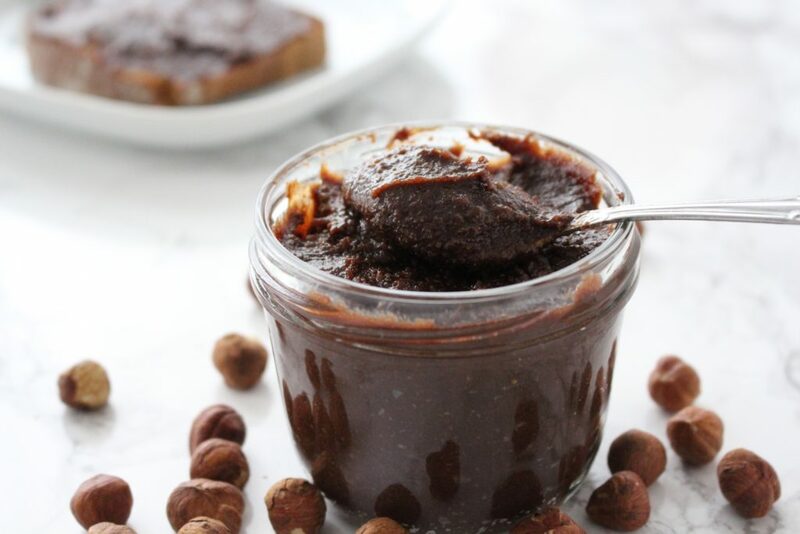 This homemade chocolate spread aka Nutella can be eaten straight out of the jar without regret. 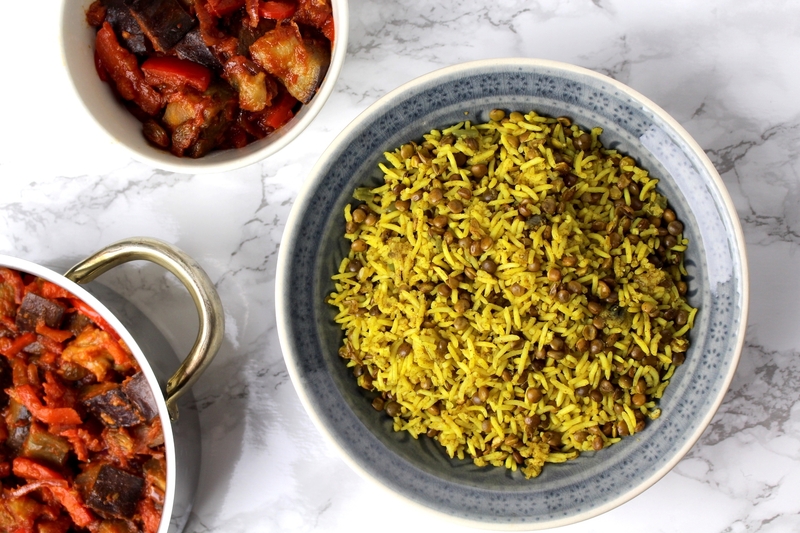 It's made with just a few healthy ingredients and so delicious. Place hazelnuts on a baking dish in one single layer and roast in the oven for about 10 minutes on 360° F (180° C). Keep an eye on them as they burn quickly. Remove nuts from the oven and let cool for 5-10 minutes. To peal hazelnuts: place nuts in a bowl, stick another bowl on top of it and shake it vigorously. 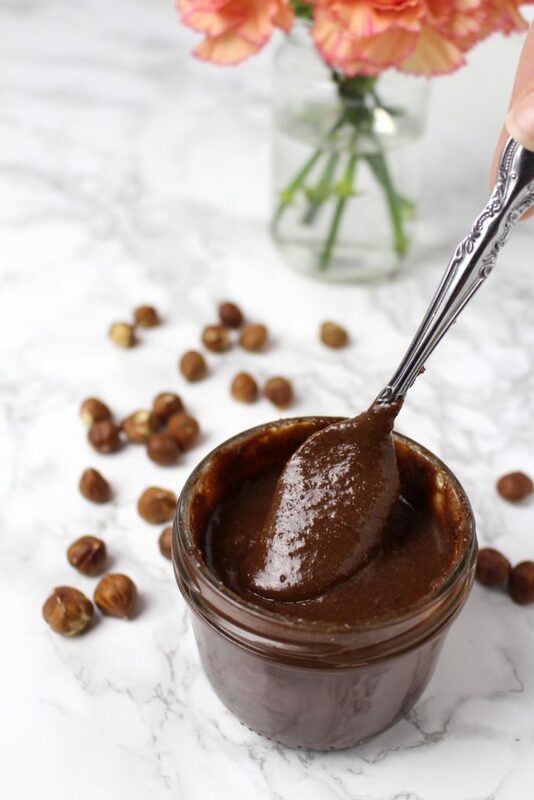 Add (more or less) naked hazelnuts to a food processor and mix for 5-10 minutes until you end up with hazelnut butter, scraping down the sides as you go and pausing every other minute if necessary (if food processor gets hot). Add cacao, maple syrup, vanilla and salt and process for another minute. Gradually add plant-based milk, one tbsp at a time until the spread has reached your desired consistency.